Cooking bacon in the oven is the best way to make a large batch of crispy, perfectly cooked bacon. It also prevents the messy grease splatter that comes from frying bacon on a stove top. 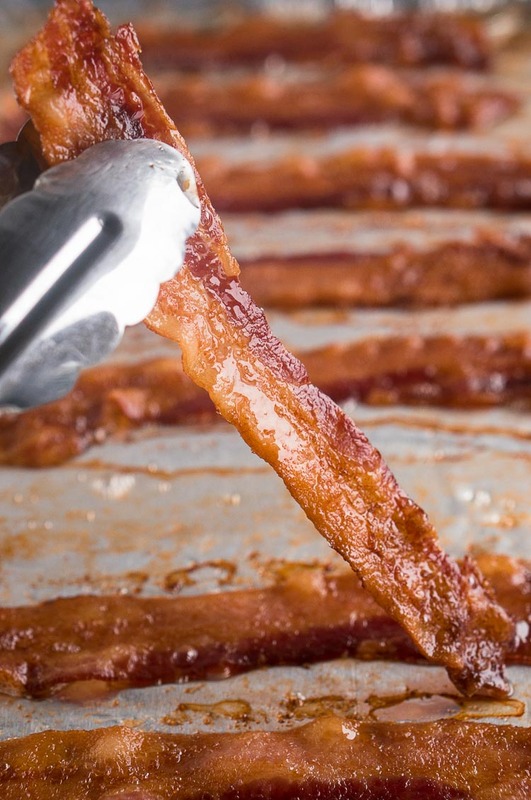 With these easy tips, you can learn how to bake bacon in the oven! 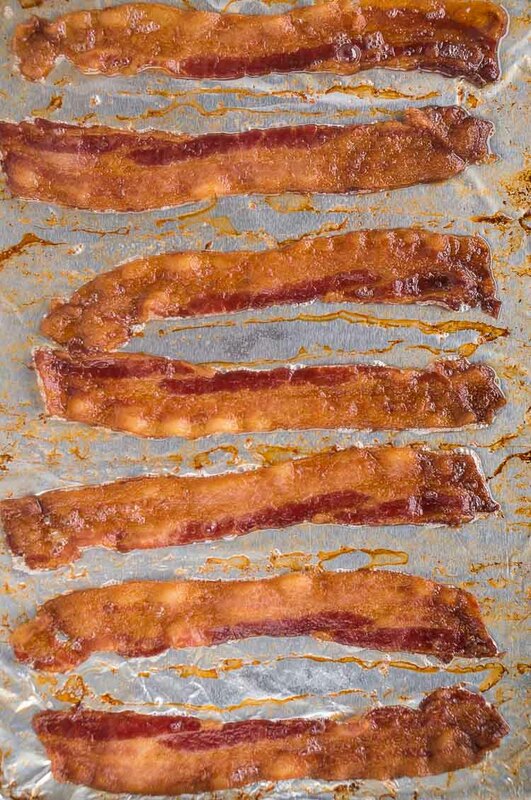 Here are my simple and foolproof tips on how to bake bacon in the oven. If you have never baked bacon before, give it a try. You will be convinced that baking bacon is easier and tastier than pan frying bacon. 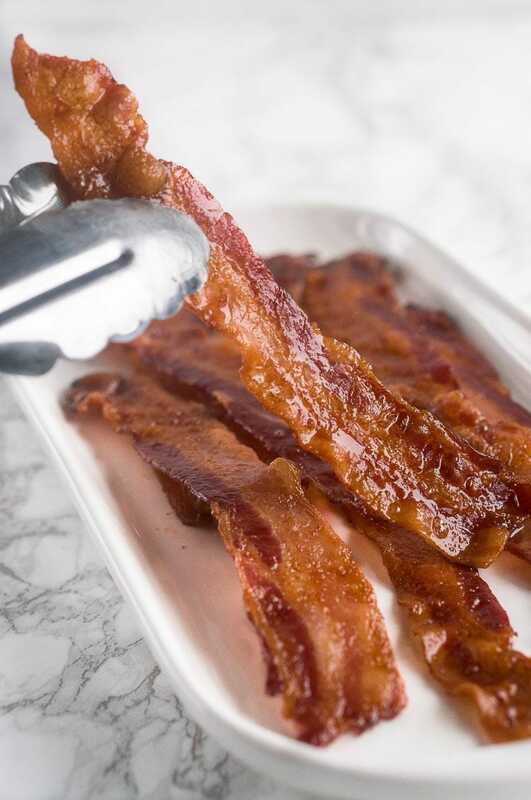 Below I share my recipe tips for the best way to cook bacon in the oven, including what is the right temperature and time for cooking. Don’t miss the helpful tips at the end for storing bacon and how to store and use the bacon fat. Use a large rimmed baking sheet. 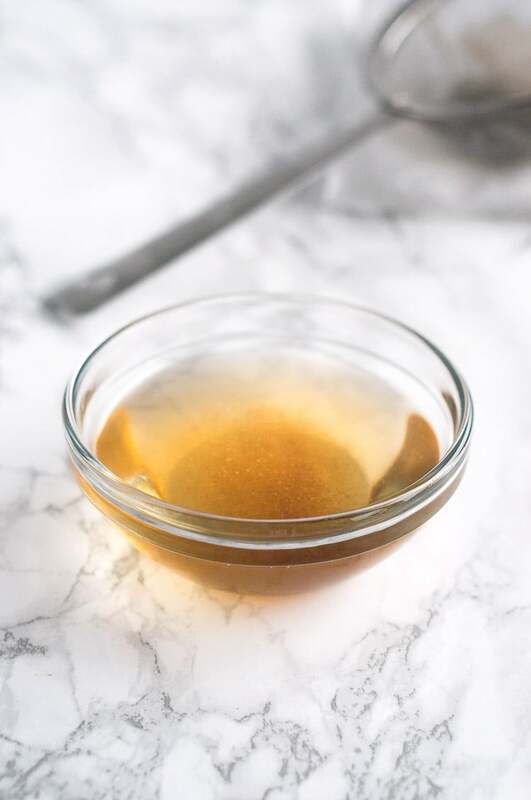 This will help you eliminate bacon fat dripping in the oven. Line the baking sheet with foil. I use heavy duty foil to make cleanup a breeze. Cook at 400 F for the most crispy bacon. Depending on the thickness of the bacon, it can take between 15 – 25 minutes. You don’t need an oven baking rack. I have tried cooking bacon with a rack in the baking sheet and without one, and I have found no value in cooking with one. It takes longer for the bacon to bake, and it’s hard to clean the rack. The bacon is equally crisp regardless of whether I use a baking wire rack or not. No flipping required. There is no flipping or constant monitoring required with this bacon recipe. Just stick the baking sheet with the bacon in the oven and set the timer. Oven Baked Bacon Cooks More Evenly. Bacon cooked on the stove tends to get crispier on the edges while other parts are undercooked. The bacon is not cooked evenly because it receives heat only from below. Cooking it in the oven allows it to cook more consistently because it is getting cooked from all sides. Oven Baked Bacon Is More Crispy. Because the bacon is cooked evenly from all sides in the oven, it is also crispier without risking burning it. 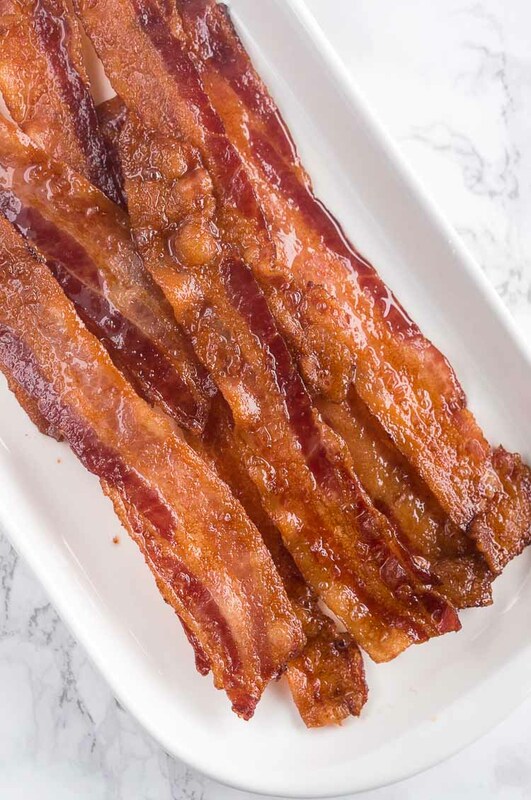 Following this oven-fried bacon recipe, guarantees you will get the golden, crispy and irresistible bacon we all know and love. Oven Baked Bacon is Effortless and Less Time-Consuming. Making bacon in the oven is a great way to prep large batches of bacon for a large family breakfast. If you have a big oven, you can even place 2 baking sheets next to each other and bake about 24 bacon strips at the same time, in about 15-20 minutes. During this time, you can make fried eggs, hard-boiled eggs, omelet or to make a batch of healthy pancakes to complete your breakfast. There Is No Splatter. 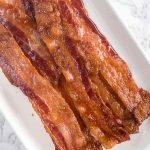 When using this oven baked bacon method, there is no splatter in the oven, the bacon just sizzles and the foil in the baking sheet catches all the grease and the oven stays clean. , the pan hardly gets greasy. 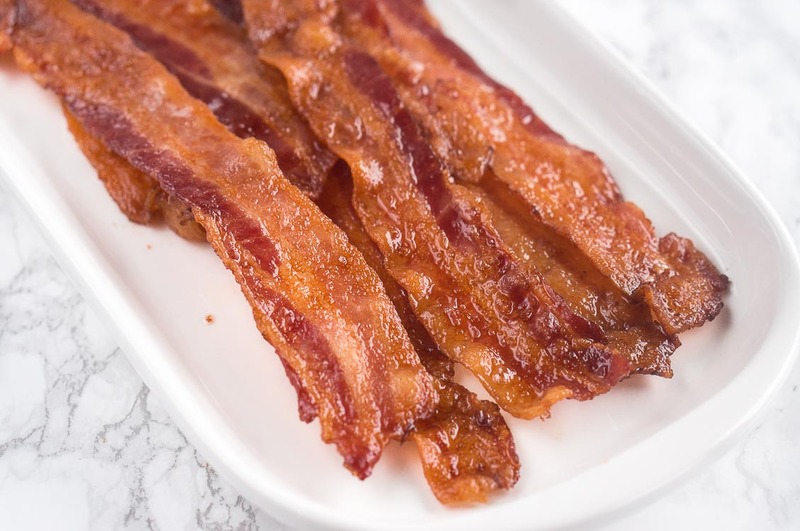 For the perfect crispy oven bacon, preheat the oven to 400 F, set the rack in the middle position of your oven and cook the bacon at the same temperature the whole time. I find that this is the right temperature for perfect crispiness. If you bake it at 375 F, it will probably be a little bit chewy and you have to cook it longer. And if you cook it at 425 F, you tend to risk burning the edges. I highly recommend cooking the bacon at 400 F for best results. Perfect crispy bacon is a glorious thing. As I mentioned above, depending on the thickness of the bacon and the accuracy of your oven, cooking time for bacon can vary, but on average, a full baking pan of bacon will take between 15 – 25 minutes to cook at a temperature of 400 F.
Bake thin bacon for about 15 minutes, medium thick bacon for about 20 minutes, and thick-cut bacon for about 25 minutes. Many people wonder if bacon is healthy because it has had a bad reputation over the years. However, it contains natural vitamins and nutrients like vitamin B, zinc and selenium which are beneficial and necessary for the body and the immune health. 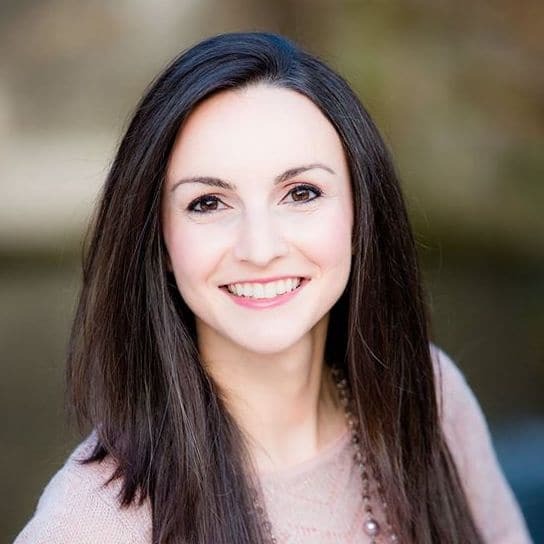 It is allowed on the Paleo, Whole30, low-carb, keto and gluten-free diet. Of course, I believe that overconsumption of bacon could be harmful and I only eat it in moderation. Also, some people might need to limit its consumption because of health issues or specific dietary needs. I personally prefer buying uncured bacon because I try to limit the amount of processed meat we eat. 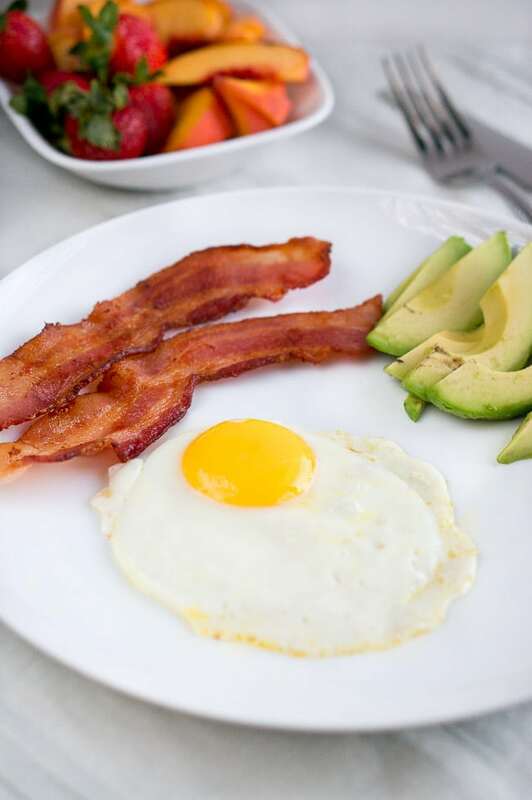 Uncured bacon is free of any artificial preservatives – no nitrates and sodium nitrites added. 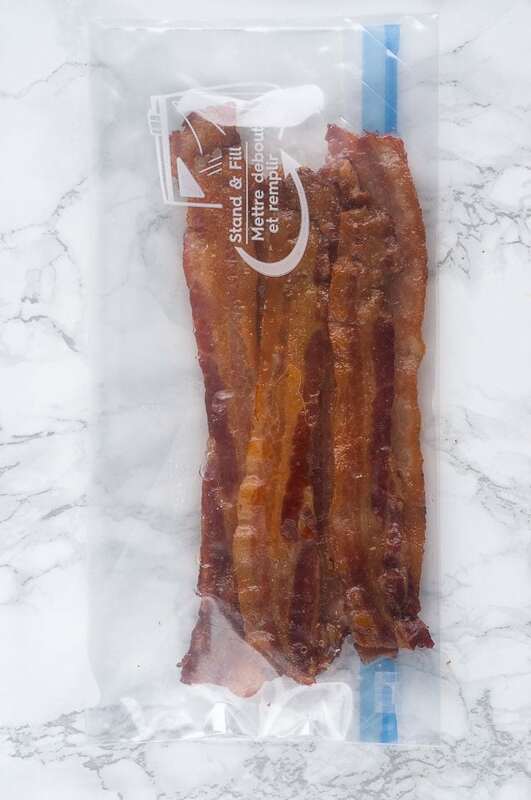 You can store cooked bacon in the fridge for about 7-10 days. And in the freezer for up to 6 months. Store fresh bacon in the refrigerator for about 1 week, and in the freezer for up to 6 months. When storing fresh bacon in the fridge, if bacon starts to change color or smell off, it’s safest to discard it. it. Just pop it in the microwave or the convection oven for a few seconds to defrost. Great way to use cooked bacon is not only for breakfast with fried eggs but also for salads, sandwiches, or soup topping. to scrape the pan, helps to get most of the bacon grease off the sheet. Cover the jar with a lid and store it in the refrigerator. Even after the bacon fat in the jar has solidified, you can add more bacon fat on top and put it back in the fridge. You can use the bacon fat for just about anything. It adds so much flavor and depth to roasted vegetables, stews and soups, and pretty much any meat. Preheat oven to 400 F. Line a rimmed baking sheet with aluminum foil. Lay bacon strips in a single layer on the baking sheet. Because they will shrink as they cook, you can place the bacon slices close together, but don't overlap them. Bake until the bacon is crispy, about 15 - 20 minutes depending on its thickness. Let the bacon slices cool on a paper towel-lined plate. Then, serve immediately, store in the fridge or freeze in a freezer ziplock bag. How did I not know bacon turned out this crispy and delicious in the oven?! It’s the perfect bacon to crumble up or to garnish on runny eggs. Love that there’s no grease splatters all over the hob too, will definitely be trying this! Love how tempting this looks! This is such a great idea! I never knew you could make this in the oven. Can’t wait to try. I always cook mine in a pan but seeing how crispy this is I think I need to try this method! This is one of my favorite techniques to use for larger crowds at breakfast time. When it’s just my husband and I prefer my cast iron skillet—but the funny thing is he just bought me a large baking griddle sheet that is made out of cast iron and I will definitely be using your tutorial soon. Thank you for including the step by step instructions. Great post! Definitely a much easier and less messier option! Thanks. I have never baked bacon but your baked bacon looks so nice and crispy, I want to try it! Plus, as you say it’s a great way to cook a lot of bacon when you’re making breakfast for a large number! I prefer oven baked bacon because the clean up is so much easier. If you know how to bake it right it turns out perfect every time!